Remember the days when Amazon was a humble online bookstore? Years later, the company has branched out into creating voice-activated digital assistants in the form of smart speakers that can switch off your lights or read you the news. Having the ability to say “Alexa” and have your questions answered may be nothing short of futuristic, but with different Amazon Echo devices all offering the same voice assistant, which one should you get? Both the Amazon Echo and Amazon Echo Dot have built-in omnidirectional microphones designed to pick up your voice from anywhere in the room, but there are noticeable and important differences between the two devices. Let’s break it down in our Amazon Echo vs. Dot showdown. The Amazon Echo and Echo Dot come with Amazon’s voice control assistant, Alexa. You can ask Alexa to read the news, do math problems, report the weather, play music, and a lot more Alexa skills. You can even create your own skills on either device using Alexa Blueprints. Just use the wake word, which is “Alexa” by default to access what the device has to offer. With 360-degree omnidirectional microphones, both devices are designed to always listen and hear you from anywhere in the room. However, while the 2nd gen Echo has a seven-microphone array, the third-gen dot has a simpler four-microphone array. Got music playing? 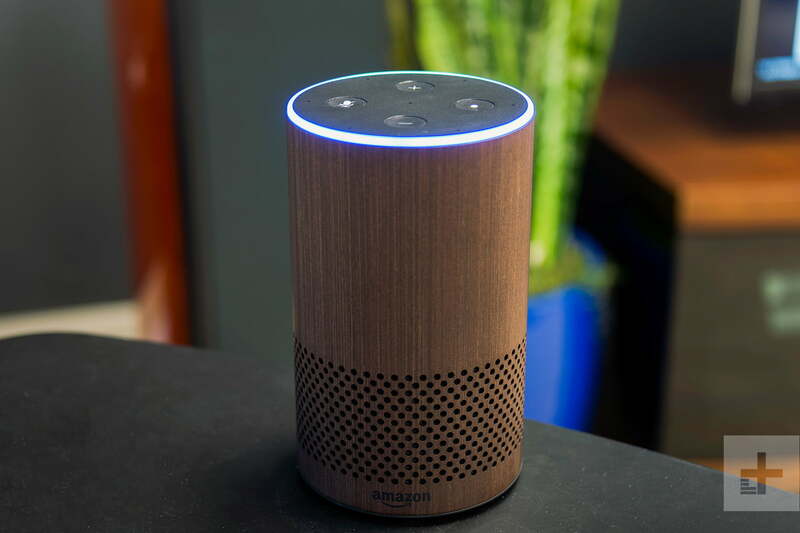 No worries, whether you have the Echo or the Dot, Alexa will still hear you over the sound of you blasting Cardi B. Well, provided you enunciate. There are lots of smart technology options on the market these days that are compatible with the Echo and Echo Dot. From Nest thermostats to Philips Hue lighting systems, and you can control your smart home systems directly from your Amazon devices or with the Alexa App. While the original Echo and the Echo Dot are almost the same in diameter, the current versions have larger differences in their diameters. The second-gen Echo is 3.4 inches in diameter, while the third-gen Dot is 3.9 inches in diameter — a difference of a half-centimeter. Echo is much taller and heavier than the Dot too. Think of the Echo as a cylindrical device. The Echo Dot is more lightweight, and it looks like a bit of a thick hockey puck. The third-gen Echo Dot is slightly heavier than its predecessors, weighing 10.6 oz. The most recent iteration of the Echo is even heavier at 1.8 pounds. The Echo Dot is also just a fraction of the Echo’s height, with the current Dot clocking in at 1.7 inches and the current Echo at 5.8 inches. In comparison to its larger sister, the Echo Dot wins in terms of portability. You can throw it in your handbag to bring along to parties, or find room for it in your home even if there isn’t a lot of shelf space for smart home devices. While both devices have a built-in speaker, the Echo’s larger, higher-quality, 360-degree speaker can blast music for you until the cows come home. Plus, the speakers now come with Dolby processing for crisp vocals and dynamic bass response for even better sound quality. 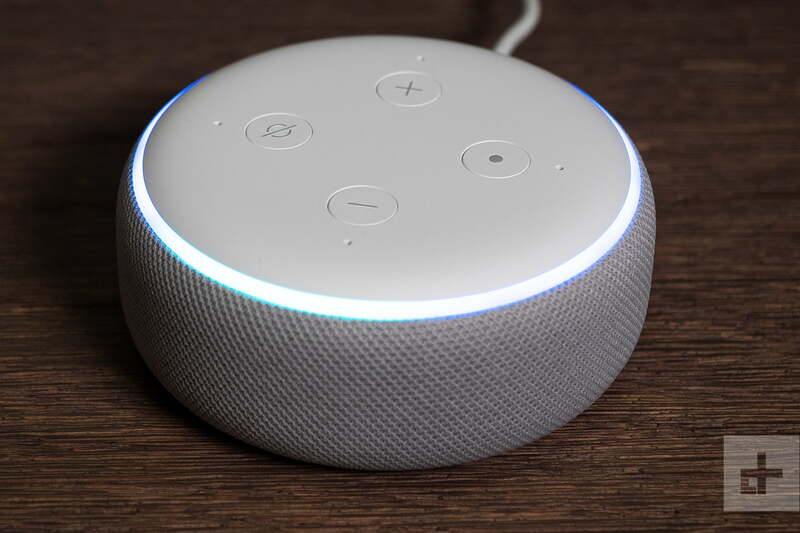 The third-gen Echo Dot has improved sound quality over the older Dots, adding a larger drive, and sounding significantly louder than the previous models. Both devices are built with a 3.5mm output jack, so you can connect them to an external speaker using an audio cable that will boost the sound quality. Wondering which one will fit in better with the existing furniture and technology in your home? The third-gen Dot comes in charcoal, heather grey, or sandstone. The Echo, however, is available in six different color schemes. Two have a wooden finish (walnut or oak), three are fabric (charcoal, heather gray, or sandstone), and one is a metallic silver. With a wide array of looks to choose from, you’ll probably have no trouble finding one that fits your home’s decor. When deciding which Amazon Alexa device to purchase, cost is probably one of the number-one factors people consider. If budget is a concern, know that the Dot is less than half the price of the Echo and offers the same functionalities. The new third-gen Dot costs $50 retail, but you can sometimes find it available on sale for around $30. The Echo second-gen sells for $100 retail, but you can sometimes find it on sale for between $70 and $75. Basically, the only difference between the two echo devices, other than size and cost, is sound. If you’re just looking to be introduced to Alexa, you’ll be fine with the Echo Dot. It has all the smarts of Alexa in a small speaker. Keep in mind when putting together your shopping list that you can connect any smart speaker to either device for richer quality sound. If you’re just looking to pick up an Echo to create a multiroom, Alexa-enabled experience, the Echo Dot is a great choice. It even comes in a kid-friendly version if you want to put it in your child’s room. Amazon also released the Echo Input, which allows you to add Alexa to your old existing speaker and retails for even less than the Echo Dot.